Facebook who commented on a post with it and I thought I would just glance at it from time to time to try to catch a glimpse of a puppy entering the world. Four hours and five beautiful wiggling puppies later I am still watching. 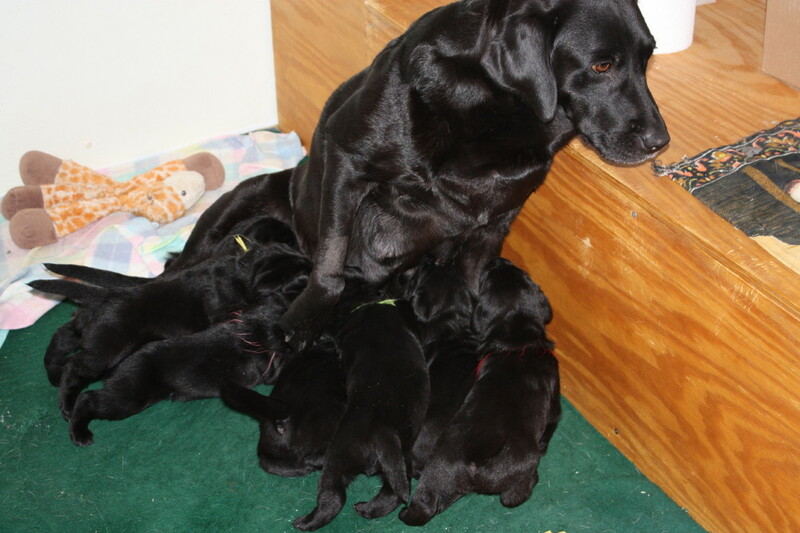 As the hours progressed she produced five gorgeous puppies, two yellow males and three black females. As each one was born she licked tenderly licked at their sacs, but as a well cared for dog giving birth in a home whelping pen she had a human to assist her immediately. She watched as the human helped remove the sac and took the puppy away to tend to it. As each puppy was brought back to her whelping pen she licked it tenderly, cleaning it as only a mother dog can, as it nursed its first drops of mother’s milk. One after another a puppy joined its sibling to nurse and join the rest of the family. Now the mother on the puppy cam is relaxing comfortably with her five babies nursing hungrily. Every now and then she leans up to give one of them a lick, and her human appears to move one to a better nursing position. She has curved her body into a crescent shape as if to keep the puppies close and to shield them with her body. Her front and back paws form a barrier that they cannot yet cross so they are safely ensconced within her reach. Tinkerbell and littermates at four weeks old playing with their mother. This is this same maternal love between mother dogs and their puppies that hit me hard when we picked up our Tinkerbell as an eight week old puppy. After months of counting down the days until we could pick her up from our breeder we were finally at her farm to pick out our puppy. We were choosing between two different females and I had fallen in love with the puppies and their mother from all of the photos that our breeder shared with us. 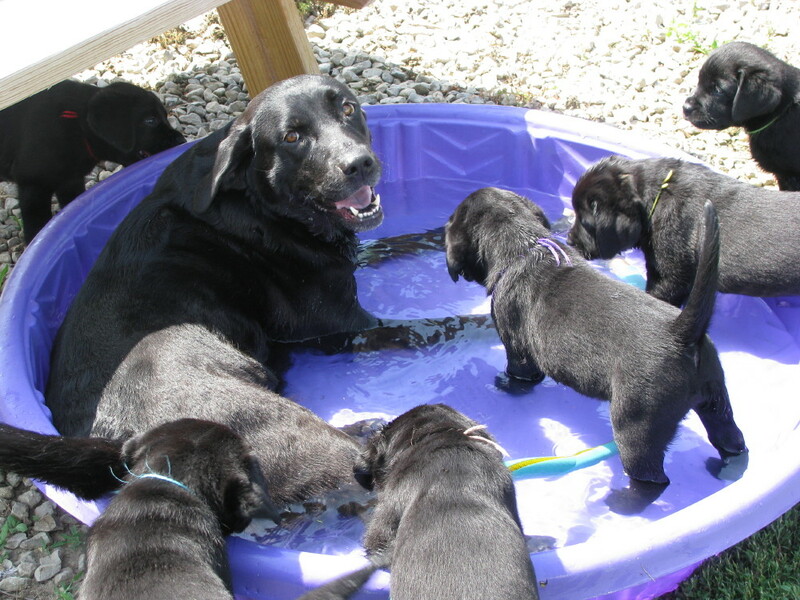 I smiled every time I saw our future puppy and her litter mates with their mom and I waffled between feeling bad that I was going to remove her from her siblings and mother and excitement that she was going to join our family. We arrived at the perfect time, our breeder was about to let the mother dog and the puppies outside to play. 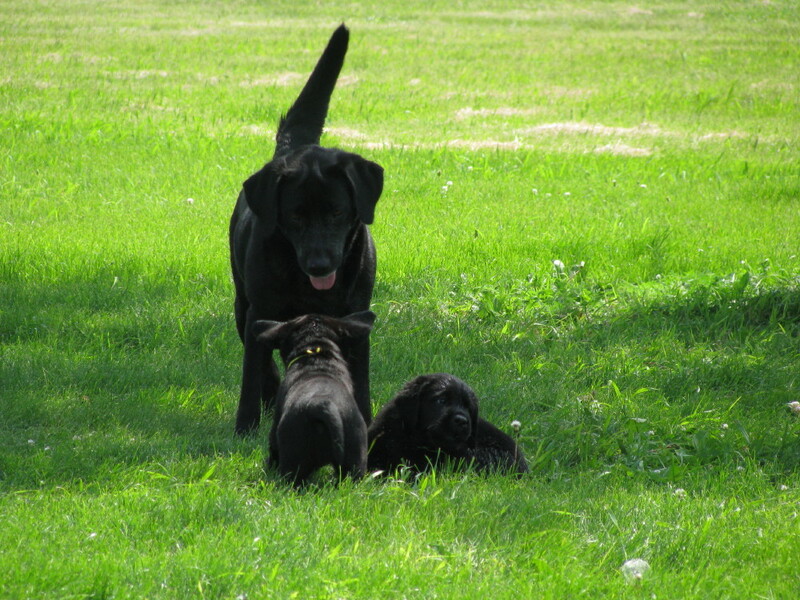 Watching the puppies and their mother frolic on that summer evening was a magnificent experience. It was obvious that she was having as much fun as they were as they scampered around her, some of them climbing on her or chasing her and some of them exploring their world. She was able to play with some of them while still keeping a watchful eye on the others, and she would break away from the ones with whom she was playing to round-up the ones who were checking out their surroundings. 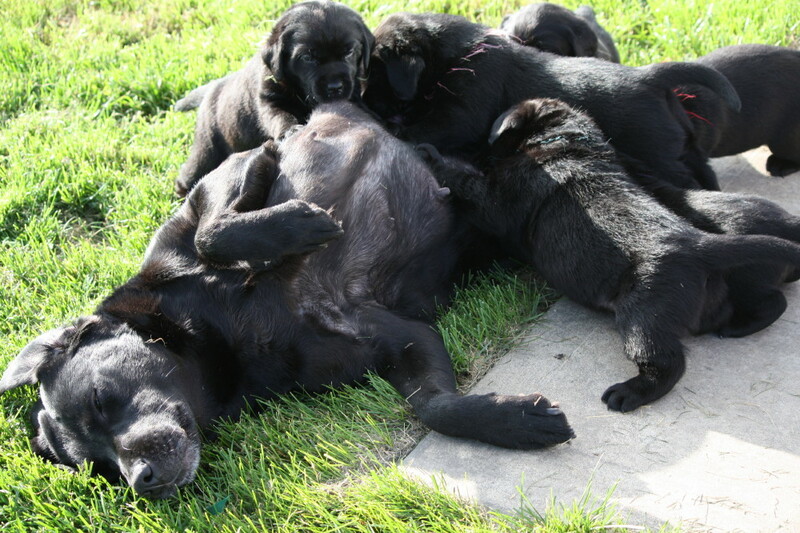 At one point Tinkerbell’s mother laid down to take a break and all seven of her chubby black puppies piled on top of her. She licked them and wagged her tail and my heart swelled with love as I watched their play session. I made a promise in my head and in my heart that I would watch over her puppy who was about to become our puppy, with the same amount of care, a mother’s love. Her puppy was a gift to us to be respected, trained, loved and cared for from the moment we signed the paperwork until the moment she crossed to the rainbow bridge, a moment that I hoped would not happen for at least fourteen or fifteen years. My wish for all dogs is that their humans love them with the same love that their canine mothers did. That this love spans our different species is one of the most beautiful parts of having a dog; it is one of the reasons many of us continually own dogs throughout our entire lives. Like I said in my first blog and I will say again many times, our dogs did not choose us as their owner. We choose our dogs and by making that choice we assume total responsibility for their care and to provide not just food, shelter and medical care but also the love that any living creature needs and deserves, just like any mother would provide.